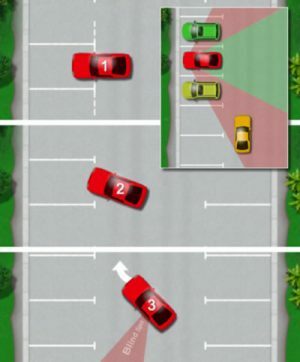 Reverse bay parking has been one of the reverse manoeuvres for the driving test for many years. Whilst this will continue, a new manoeuvre is introduced; forward bay parking, which as the name suggests, requires the test candidate to drive forward into a bay and reverse out. The traditional reverse bay parking manoeuvre is only conducted within the (relatively controlled) grounds of the test centre. One of the more significant aspects of the forward bay park is that it is to be undertaken in much more public locations such as hotel and supermarket car parks. Anyone with any experience of reversing out of a bay at a supermarket will tell you that a drivers observational skills are highly tested here. Many pedestrians have little regard for a reversing vehicle and will assume that you see them as they walk directly behind your moving vehicle. Children being difficult to see may be running erratically around you, stray shopping trolleys, impatient drivers shooting past as you’re reversing, other drivers reversing out of their bay at the same time as you – the list goes on. If you are required to carry out the forward bay parking manoeuvre, you’ll hopefully be taken to a quieter section of the car park, though practice and preparation should be taken to ensure observational skills are effective under all circumstances. Reference points make manoeuvres easier as they offer a guide on where your car is at any given time. These are provided on the forward bay reference points guide. 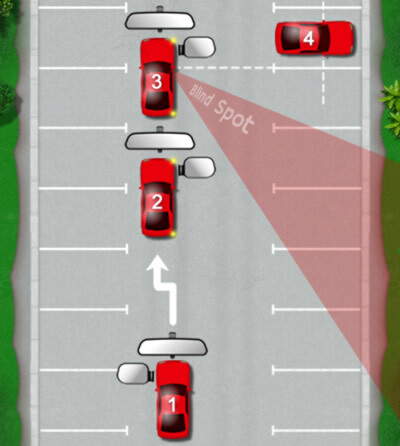 The forward bay parking manoeuvre will be conducted in a car park where the test candidates will have various options to choose an appropriate bay. For example, the examiner will not use car parks where only a single bay available. The candidate will be able to choose a bay either with or without vehicles parked to the side. The instruction given by the examiner will vary depending on the layout of the car park. For example, if there are only bays on the right-side, this will be reflected in the instructions given. Essentially, you’ll be given instruction to drive forward into a bay (to either the left or the right if available) and to then reverse out, the choice of bay is for the test candidate to decide. You cannot drive through the first parking bay and park in the bay in front of that. For the reversing section of the manoeuvre, you must not reverse into any bays behind you. You are permitted to make corrections. For example, if you are entering a bay but feel that you may be too close or driving on one of the lines, you may reverse again, sufficiently enough to correct your position. You may choose a bay that has cars parked either side, or to one side or that is clear of vehicles both sides. Tip: If available, choosing a bay that is clear of vehicles both sides will make observations whilst reversing far easier. Throughout the manoeuvre, keep the car very slow – think slow walking speed. This will allow you to remain accurate, whilst simultaneously observe and react with potential hazards around you. Continuously look into your mirrors and around the vehicle. If you see any pedestrians, cyclists or other vehicles approach your vehicle then stop. Wait until they are clear and have moved out of your way before continuing. Another driver may stop to allow you to continue, in this instance carry on, but first check all-round to ensure it is safe to do so. This tutorial covers a forward bay park to the right. The reversing part of the manoeuvre will be covered further into the tutorial. Enable as wide turning radius (turning circle) as possible – this will make it easier for you to accurately enter the bay. To do this, use as much of the road as possible by moving over to the left as far as you can, avoid driving over bay markings or getting too close to parked vehicles. Before you do this however, check your internal and left mirror to ensure it’s safe for moving over to the left. It’s important that you show your intentions by signalling to the right. Before doing so, check your interior mirror followed by your right door mirror. You will now reach your first reference point. This reference point is also your point of turn (see forward parking to the right reference point). From the bay which you intend on driving into, when the first line appears just under your right door mirror, stop the car (you don’t have to stop, but it slows the manoeuvre down, allowing for better observation). Now take a final look into your interior and right mirror, followed by the right blind spot. If all clear, very slowly move off and immediately steer quickly to full right lock. As you enter the bay, straighten up your steering when your dashboard is in line with the horizon, or something else such as a hedge or fence. In order to know where to stop, the next reference point is when the end bay kerb or line comes just under your door mirror (see reference points). When the kerb reaches this point, you will be safely in the bay. Once there, select neutral and apply the handbrake. This tutorial covers a forward bay park to the left. If you have an opportunity of parking to either the left or the right, turning right into a bay can be slightly easier due to clearer observation of the bay lines as you begin to enter the bay. Further, turning right into a bay does not involve moving onto the opposite side of the road (against the flow of traffic) as it does with turning left into a bay. As with turning right into a bay, you’ll need to maximise the turning angle of your car. To do this, move over to the opposite side of the road before turning. Before doing so, check your interior and right mirror and the right blind spot. Now check your interior and left mirror and signal to the left. You will now reach your reference point and point of turn (see forward bay to the left reference point). As with turning right into a bay, stopping the car at this point slows down the manoeuvre allowing for better observation. Being on the opposite side of the road is hazardous, so before making the turn, check the interior and left mirror, followed by the left blind spot. If all clear, slowly move off and immediately and quickly steer full left lock. Enter the bay and wait for the end of the bay line / kerb to fall just under your door mirror as a reference point on where to stop. Some car parks, particularly those that may be of limited space may utilise a one-way system. If there are painted road arrows which dictate the flow of traffic, it’s important that you reverse in a direction that allows you to drive off with the flow of traffic. Your view of the road that you’re reversing into can be significantly restricted, particularly if there are vehicles parked either side of you – the green shaded area of the inset image displays the limited view in which you can see of the road. It’s critical that you begin reversing very slowly, continuously look up and down the road that you’re reversing into and stop if any vehicles approach. 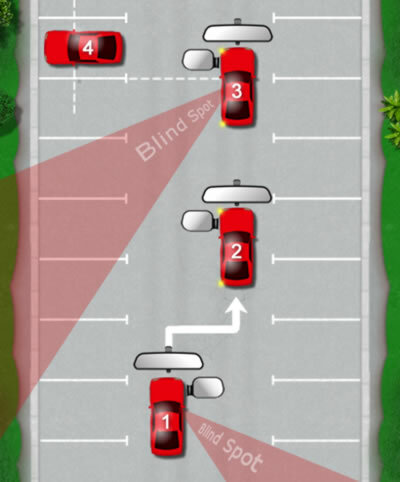 If possible, look through the windows of parked vehicles to aid observation. Before reversing, get the car ready to move by selecting reverse gear and hand on the handbrake ready to release. Look up and down the road that you’ll be reversing into as much as your view will allow. If all looks clear, look in the direction of travel and begin very slowly reversing, think of a ‘crawling’ speed. It’s essential at this point that you’re prepared to quickly stop your car. If a vehicle approaches, stop to assess their actions. They may drive around you or they may stop. If they stop, continue with the manoeuvre. Continuously look around before moving and during. Continue to reverse straight until you reach the reference point. As you begin to turn, the front of your car will swing out. It’s important that you not only observe the road you are entering, but now also the front of your car so to avoid it hitting a car parked in the bay alongside you. At the reference point, or ‘point of turn’, turn the steering wheel half turn to either the left or the right (see forward bay park ‘reversing out’). Which way you turn depends on which way you want to reverse and drive off. For your car to reverse to the left, steer to the left and for your vehicle to reverse to the right, steer to the right. When you are confident that the front of your car is clear of vehicles parked alongside you, proceed to full lock. Continue to reverse for a sufficient distance on full steering lock until you are confident that you have enough space to drive off. Stop the car and select first gear and before moving off, check the left side blind spot if you reversed out to the left, or the right side blind spot if you reversed out to the right. You check the blind spot before moving off to ensure there are no pedestrians, cyclists or motorcycle riders about to pass in front.